We resume the sports bucket list today. One of the most legendary facilities in the country, and located in a small college city in Florida, The Swamp is college football. One of the other venues I’ve already been too, this facility is one of the best in the country. The Swamp is filled with passionate Gator fans who’ve come to expect great football to be played every year. The stadium is very cool facility and I like the architecture of it alot. The crowd is great and always into the game. Playing games in Gainesville is not ideal in the early season though, as the weather does not often cooperate. Its hot and often rainy in September, but that never stops the crowd from showing up. The town of Gainesville is surprisingly big, but still has the feel of a college town. Everything is centered around the university, but because its so big, the town reflects that. The downtown area’s near the stadium are cool, and gamedays around the stadium are just like many of the premiere southern tailgating traditions. Overall, this is a trip I’ve now made multiple times and I’m very glad I did. A must for any college football fan. The Doak is one of college football’s most legendary facilities and was a large part of the success of the Florida State Seminoles in their dominant stretch of football in the 1990’s. Traditions are a large part of the game, from the tailgating to the pregame tradition, and of course the famous warchant, FSU has plenty of them. Tallahassee is an interesting town and so is FSU’s campus. Both have their ups and their downs, but overall are fairly nice as a whole. The facilities on FSU’s campus are very good, and I really enjoyed the band playing in the baseball stadium before the game. Overall, this is a trip well worth making and is one of the iconic scenes of all college football. One of the most famous Golf Courses in the World, TPC Sawgrass is actually on 30 years old. Its claim to fame is of course the 17th Hole and the island green. What makes this hole special is not just the fact that its basically surrounded my water, but so many other things. The hole is very short, only 140 or so yards, but makes professionals look silly year after year. Thousands of balls go into the water each year which has large alligators in it. Finally, the thing that makes this hole so exciting is the stadium like atmosphere of it. Surrounding the hole on three sides in a tremendous amount of seating, and even luxury boxes. There is not other hole is golf where you see a crowd like it. The rest of the course is great too, and has quickly become the site of the richest golf event of all time, where the winner now takes home over 1.7 million Dollars. I have been the tournament once, but one day would love to take my chances at the course, and the 17th hole, which actually looks easier when you see it in person. Keeping with the golf thing, if there is one course to rule them all, this might be it (or St. Andrew’s). The best manicured course in the world and the site of the greatest golf tournament each year, Augusta is golf at its finest. Each spring we get to see flowers and trees blooming in almost perfect weather, at a course which seems to be almost too perfect. There are so many iconic images from the course, and so many amazing moments have taken place there. As you may imagine, I do play Golf, and this one course is where I’d like to visit the most. 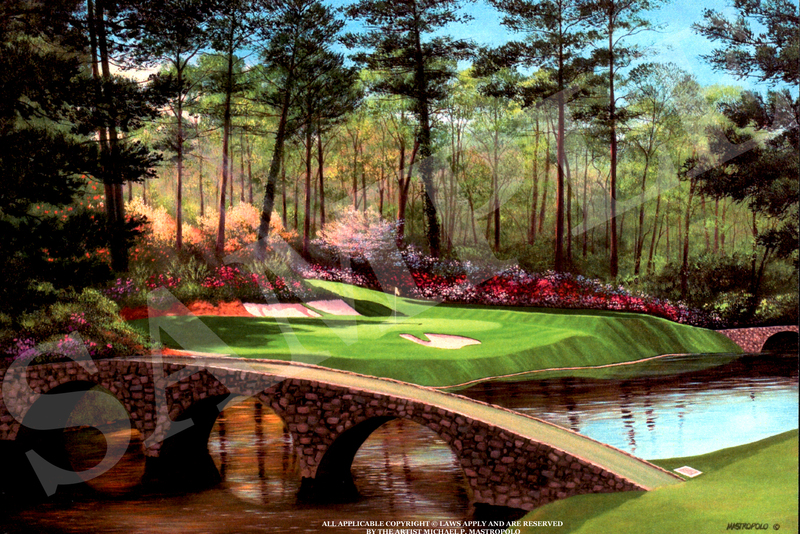 One day I’ll make it to the Masters, and I guarantee it will be amazing. In fact, I would give up golf for the rest of my life if I could play a round of Golf at Augusta on a perfect spring afternoon, that’s how much this course means to anyone in the game. This is without a doubt one of the three most famous baseball stadiums of all time, and on any one baseball fans list of stadiums to visit. The stadium, like Fenway, is incredibly old now, but still stands strong. The most recognizable image of the park is its ivy covered walls. Built in a neighborhood, more than a city, the rooftops out to left field serve as places to also watch the game. It is tough for me to completely give a rundown of the stadium as I have not been there, but I plan on making a first trip to Chicago soon. The city of Chicago is one of the only iconic places in the country I have not visited, and I really look forward to it, especially considering its similarities to New York in many ways. I hope that the Cubs don’t make the mistake and ever tear down Wrigley. While it is realistic that the ballpark won’t last in its condition forever, or much longer, they should go about it a different way. They can “renovate” the park, by keeping the iconic parts of it alive, while fixing up the stands and locker rooms, because the playing field is what is most important. First thing on my list, I’ve already checked off. I visited Auburn last fall and I was very glad I did. The people were very nice for the most part and its your classic college town. The town itself is nice, fairly small and right next to campus. Its Alabama, so its hot often, but from visiting other college towns, its no problem. The Auburn campus is nice, but not nearly as wooded as I expected. There is a mix of older nice buildings, and the 70’s architecture that I hate. Jordan Hare Stadium is big, 87,000 people big. The enclosed endzones and location make the surroundings of the stadium rather irrelevent. Inside the lower bowl is huge and the students pack their section. I really like their student ticket policy, that is mostly first come first serve, forcing the students to get inside the stadium early. This helps create a great pregame atmosphere. While traditions are great, I liked the willingness to do cheers and sing songs as a group. It was the most coordinated student section I’ve seen in my experiences so far. One thing I don’t like about the stadium is how far away the stands are from the field. While I did not sit down at field level I know some people who did and they couldn’t see the game. That means watching the jumbotron, which is not what you pay for. If the sidelines were closer it’d help Auburn’s home field advantage by making it louder out on the field. Overall the stadium is very loud, and one of the loudest I’ve been too. Overall its a great college atmosphere and most definitely worth visiting. The other side of Alabama I have not been too yet, so I have less to say. Alabama is the most successful college football program and the energy and passion of their fans is unbelievable. I want to experience how they do it, where they win. College towns are great I’ve heard Tuscaloosa is a fun place. Bryant-Denny Stadium is huge now, over 100,000, but I’ve heard its not quite as loud as some other venues. Still its supposed to be a great atmosphere and being their for a huge game like Auburn-Alabama is something I must do someday. I thought long and hard about not including this, but attending the Rose Bowl as opposed to a UCLA game made it more appropriate. The Rose Bowl is the most famous bowl game in the country and attending the game, and perhaps the National Championship there seems like something I must do. I’m not a huge fan of Southern California, but this is at the top of my list of places to go there. The Rose Bowl is clearly a much better facility for football then the Colosseum in LA, and the Parade of Roses is something everyone raves about. Perhaps while I’m in Pasadena I will visit Dodger Stadium too, but that facility doesn’t have the history of architecture to lure it to my list. Another bucket list accomplishment, I was at AT&T Park back when it first opened and before it was called many different things. This ballpark is really cool, and one of the best in baseball. The uniqueness of it includes the bay right outside the stadium, as well as many of the attractions inside. San Francisco is a very cool city to begin with, and worth visiting atleast once in your life. Make a trip to Alcatraz and many of the other sites, but this ballpark is a baseball fan must. While afraid of earthquakes, its worth gambling a plane trip out there for a game sometime, perhaps against your team visiting in town. I’ve not been to Boulder for a game, but this is one of the most recommended trips I’ve heard about. Folsom Field lies in the foothills of the Rockies, and is a very picturesque and unique facility. Add in Ralphies Run, where they have a live Buffalo run out before the game, and we’re talking something pretty cool. It’d be nice to sit in on a big game, and a black out in Boulder once the Buffs can turn around the football team. The whole Denver area is cool, and Colorado in general, so why not make a trip, and maybe hit some of the nearby slopes if its a late season game. Stairway to Heaven=classic song, and it somehow seems to relate to this whole doing stuff before I die thing...of course if there's a heaven? This is an idea I’ve been going over for years. I love sports and there are many places I want to go before I die. I’d love to spend a year just traveling around to stadiums and towns across the country, but money and time don’t allow that, so I try to squeeze in whatever chance I can get. The format and explanation of this is pretty simple, I’m going to go through every place or event I’d like to visit before I die, as well as those I’ve already visited and I recommend every sports fan should enjoy. This list is going to be loooooooooooooooooooooong, so I’m going to group the list into groups of five. Each post I will write a short snidbit about 5 places I’ve been or want to go. I’m not sure how long the list will be or how long it will take me, but in the end I’m sure it’ll be pretty freaking awesome. So sit back and enjoy my personal recommendations and desires, of places to go across the country (and maybe even world).